During the last days series of reasonable displays developed over Southern Finland. Three of them were in moonlight and one in sunlight. Elliptical halo, 9° and 18° halos and Parry arc were observed. See photos and drawings here. 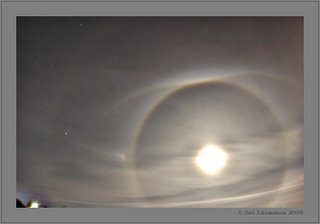 The picture on the left shows the halo development in Tampere on the night of 14/15 March. Among common halos, faint 9° halo and Parry arc are also present. It's a really impressive moon display. We Germans live current in dire (heavenly) halo poverty. It's wunderful to see such halos at least in pictures! More Jari Luomanen photos are now at his web page. Follow the link in the news. I have updated link to his page in the 14/15.3. gallery. Or you can get there via this link. Thanks Marko for providing the other link. Claudia, let's hope that the halo slump you're having in Germany will soon be over. Impressive display Jari, Last halo I got was a moon halo like yours but it did not have parry or the 9d halo but it did have an impressive CZA. I got two impressive displays on the 24th and the 25th of september in 2004 when my brother and I were camping and they both had parry arcs and one had an almost complete parhelic circle. I'm glad to hear that you're getting fine displays Michael. I've just added some new material on my page about this display.